Coeur d’Alene and the surrounding area is bursting with song this summer. On nearly any night of the week you can find live music, most of it outdoors and much of it free! Start your week with LIBRARIES ROCK: Free, family-friendly concerts at the downtown Coeur d’Alene location, from 5-7 pm. Check out local fave Bill Bozly (Aug. 13). Wednesday downtown is busy! Stroll the FARMER’S MARKET, 4-7 pm at Fifth Street and Sherman Avenue — both Wednesday (Coeur d’Alene) and Saturday (Hayden) markets feature live music. Then head towards McEuen Park for LIVE AFTER FIVE. Bring your preferred seating, pay your $5 entry (season passes available) and kick back for a perfect summer evening, with bands like the Powers (July 11). Thursday options start downtown at the beautiful BLACKWELL HOTEL, where its Backyard Bar is the place for live music 5:30-8 pm through Aug. 30 (facebook.com/blackwellhotelcda). At Riverstone, the 12th annual ARTS & CULTURE ALLIANCE SUMMER CONCERT SERIES runs from 6-8 pm and includes various beverage and food vendors. Check out Coeur d’Alene’s very own Symphony (Aug. 9) or the Idle Poets closing out the series (Aug. 30). Visit artsandculturecda.org/summer-concert-series. Get out on the lake for live music Fridays with COEUR D’ALENE CRUISES BANDS ON BOATS, through Aug. 31. Tickets are $25 for ages 21 and over. 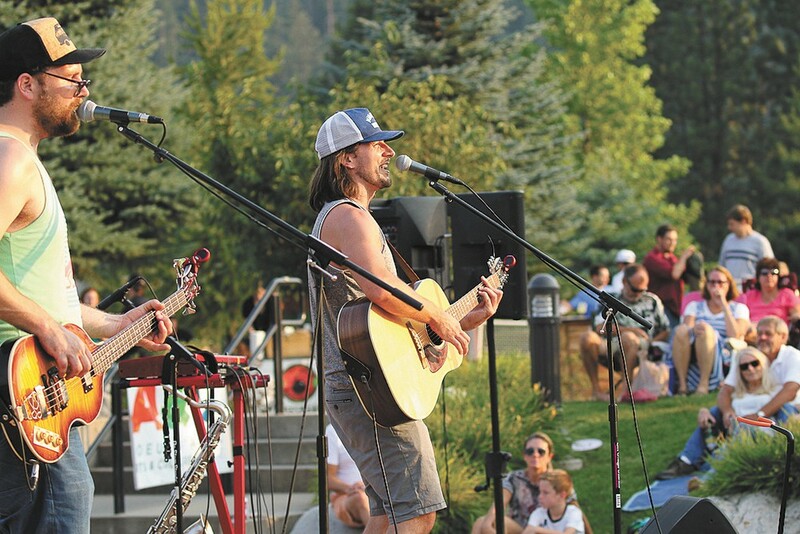 Sunday serves up free COEUR D’ALENE CITY PARK SUMMER CONCERT SERIES by Handshake Productions through Aug. 19, from 1-4 pm, ranging from the Hot Club of Spokane’s blues and swing (July 22) to the Kelly Hughes Band (Aug. 12). Ready for a road trip? Get to SILVER MOUNTAIN for outdoor adventure by day and an evening of live music every Friday and Saturday at Noah’s Canteen (visit silvermt.com/Things-To-Do/Event-Calendar). Or make it an overnighter at the COEUR D’ALENE CASINO RESORT & HOTEL, where the concert series continues well past summer. The Culinary Stone’s summer series pairs Post Falls Brewing this week with the music of Kathy Colton and the Reluctants, as well as a menu of smoked baby-back pork ribs and Boar’s Head sausages. 4-7 pm; the Culinary Stone. Three days of delicious barbecue start Friday when 10 different pitmasters serve up their best barbecue at McEuen Park. Local favorites Selkirk Abbey, Tricksters Brewing Co. and Mad Bomber Brewing will be onsite. $10 general admission; Friday, 4-9 pm; Saturday, 11 am-9 pm; Sunday, noon-6 pm. Visit greatnorthwestbbq.com. From the Ashes, An American Smoked and Fired Foods Adventure, will welcome nationally recognized pitmasters from all over the country to Coeur d’Alene this weekend. In addition to sampling amazing brisket, ribs, sausage, trout and more, guests can also visit the “application station” to learn how to smoke and fire foods better at home. $15-$83; 11 am-8 pm; Settlers Creek, 5803 W. Riverview Dr., Coeur d’Alene.